Dolores Umbridge is one of the only villains that’s truly made my stomach churn; right there with Mildred Ratched (Nurse Ratched of One Flew Over The Cuckoo’s Nest). Same can be said for Frollo of Disney’s Hunchback of Notre Dame, who is considered the scariest Disney villain due to his realistic fear striking. Sister Jude (Judy Martin) of season two’s American Horror Story: Asylum fits this category to an extent. Why? Besides these types of power hungry individuals actually existing in our schools, work place, etc. They are directly responsible for keeping the wheel of these inhumane systems of bigotry, hatred, & separation moving. They are enablers that weasel their way into positions of power; specifically through some sort of position that has direct influence over others on an institutional level. Schools, mental hospitals, government positions, etc. are perfect examples of intuitions where the minds of the masses are in a vulnerable position and easily influenced and steered. What’s most disturbing is their methods of concealing their bigotry and intolerance. They hide it, and they hide it well; much of it using subtle means. They will do all that they can to convince you that you are somebody or something that you are certainly NOT. They do this by manipulation, coercion, and delivery of some sort of sermon. Anything to convince you of what they believe to be their truth. Their lull’s and smiles are covered in poison as they pretend to nurture you. When in the presence of someone like this, we often feel drained, sick, or dirty on an energetic level. Sometimes these malevolent institutional gatekeepers are very observant and will use their observations of you to their own advantage. Others will just call it as they see it. Does it come as a surprise that many of perpetrators/institutional gatekeepers are women? To me, not really. These women–even if they claim their behavior is all them–aren’t always aware (or are) that behind them is a council made up of mostly–if not all–men. These men know and perpetuate a system sometimes even they don’t fully understand. Either way, you can’t negotiate with these people. As the disfranchised, misfits, dreamers, weirdos, and regular everyday folk, we have to mass together if we want things to change. They may think they have power over others….but what they don’t understand is that the rest of us outnumber the power hungry 99 to 1. Year of the Norma/Norman Bates Mother/Son Dynamic? Is this the year of the Norma/Norman Bates mother/(killer) son dysfunctional relationship dynamic on TV? No seriously, we have the actual Norma & Norman Bates of Bates Motel, with Norma having to come to terms with her sons psychological illness and issues getting worse and worse; we have Oswald Cobblepott & his mother, Gertrud Kapelput that have a weird connection all their own going on; and then there’s psychotic, copy-cat clown, serial killer, Dandy Mott, and his mother Gloria in this season (four) of American Horror Story: Freak show. What do these mothers & sons all have in common? Well…the sons are all obviously killers; their mothers know this…or will soon find out…they’re unabashedly devoted to their boys, yet they haven’t a clue how to properly deal with their sons descent into madness…. But watch out: These overprotective mothers will do whatever it takes to make sure their boys are safe from harm; even if that means hiding the bodies for them, and crossing a few moral lines themselves along the way. First rule: Let your son take his bath. Alone. Capiche? …All kinds of awkward here. He’s had a rough day dealing with all kinds of pre-Batman criminal mob stuff. I think he can sponge bathe himself. Second: I’m going to feel very sorry for the poor unfortunate lady soul that may date Oswald in the future. 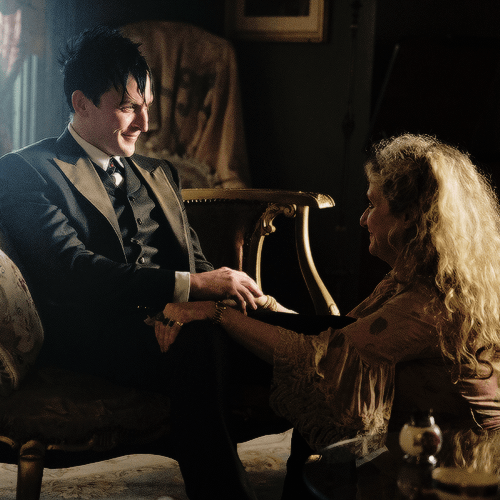 …Both because he’s Oswald Cobblepott and, of course, Gertrud. Nah. I joke. No! Really! 😉 Kudos to whomever dates Robin Lord Taylor’s Oswald. He’s a keeper. Oh hell…lets be real: These mothers are facing their own journey and descent into madness. Yeah, Gloria….where he devours them into that void of a mouth, behind that faux DCnu Joker mask. In spite of these mama’s over-protective killer instincts…the monsters their sons have become reflect a really nasty reality we face today: Enabling undesirable, unacceptable, and often abhorrent behaviors in people in order to maintain the status quo; particularly at any costs, and especially if said person has a reputation to maintain. It’s much worse when the killer is rife with privileges, which include class, gender, and race–specifically the white, rich, males who have some sort of societal and class protection. Dandy Mott is a perfect example of someone whose privilege and stunted emotions run unchecked. Sheltered from the world and spoiled rotten by his mother hasn’t helped his psych any either. He’s come to embrace his inner emptiness and darkness, as well as pulling inspiration from the now deceased, tortured soul, Twisty the clown (pictured above). Same could be said for Norma Bates. In that corrupt, quiet, coastal Oregon town there’s only so many places one can hide a body. Norman is still a teenager, and has killed two people or more already….though his diagnosis and motivation isn’t necessarily caused by malice or sociopathy…that we know of. Norman’s blackouts are still something to be explored. He may just have a bad case of mental illness…We’ll have to wait and see. We know where his story goes…but it’s the mechanics of his mental illness we need to understand. Either way…It’ll be interesting to see how far these mothers are willing to be pushed, both by themselves and by their sons’ madness. Gloria, haven’t we seen you at this angle before? Oh! Wait!